One of the best-known battles of World War One was the Gallipoli Campaign, which resulted in a loss by each side of a quarter of a million casualties. Britain originally assumed that the Ottoman Empire did not pose a significant military threat, and therefore could be ignored until the European portion of the war was finished. But the Germans ruined Britain’s plans by embarking on trench building. Trenches ran for 35,000 miles up and down Western Europe, and the British could not see a way through without coming from Germany’s rear. The British Secretary to the War Council, Maurice Hankey, articulated the subsequent British policy that “Germany can perhaps be struck most effectively, and with the most lasting results on the peace of the world through her allies, and particularly through Turkey.” The way into Turkey was from the Mediterranean through the 38-mile-long strait, the Dardenelles, and past the forbidding heights of the Gallipoli Peninsula. 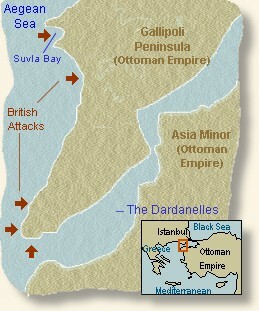 Churchill, Lord of the Admiralty, tried to argue for a combined attack by the army and navy; the strait is at no point more than four miles wide, and if the Turks were dug into the heights, a purely naval attack would merely provide the Turkish artillery with an opportunity to make literal the concept of “turkey shoot.” But the War Minister, Lord Kitchener, declined to provide any troops for Churchill’s navy; he felt they were needed in Europe. Thus Churchill was forced to do his best with the navy, and the inevitable disaster ensued. Following the initial failure of the naval attacks, Kitchener agreed to send troops, but without depleting the forces in Europe. Therefore, volunteers from Australia and New Zealand were recruited and formed into the Australian and New Zealand Army Corps (ANZAC). The troops landed on the beaches below the entrenched Turks on the heights, but were never able to scale the cliffs. More than 16,000 Anzacs died trying to break out of the beachhead. On November 22, 1915, the British decided to cut their losses and evacuate the troops. Planning moved quickly and efficiently. The evacuation began on December 15, with 36,000 troops withdrawn over the following five nights. The last party left in the early hours of December 20, the night of the last evacuation from Suvla Bay. British and French forces remained at Cape Helles (the rocky headland at the southwesternmost tip of the Gallipoli peninsula), until January 8-9, 1916. Gallipoli had been a costly failure for the Allies: 44,000 soldiers died trying to take the peninsula from the Ottomans. Among the dead were 2779 New Zealanders – about a sixth of those who fought on the peninsula. Victory came at a high price for the Ottoman Empire, which lost 87,000 men during the campaign. A good way to find out about the sacrifice of the Anzac troops is to see the 1981 movie “Gallipoli,” directed by Peter Weir and starring Mel Gibson, inter alia. The movie, which won a number of awards, will bring the battle to life for you.